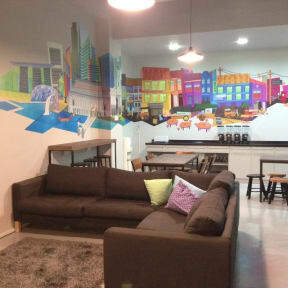 Five Stones Hostel i Singapore, Singapore : Boka nu! Five Stones Property is located in the 'Arab Street' area right smack in the middle of Singapore. Arab Street is an up and coming area, full of buzz, full of life. With many eating and drinking options for you to choose from our new location is also at the intersection of bus and subway routes. Just a stones throw away is Little India, another great area to explore. 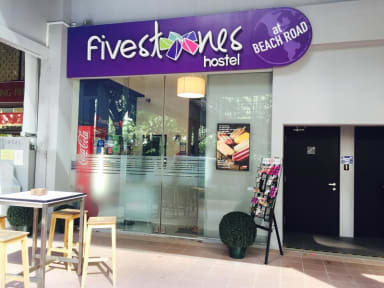 Five Stones Property is the leading backpacker's property in Singapore. Our immaculate air conditioned rooms, our comfortable lounge area, and free Wifi take the hassle out of your stay. We provide a free breakfast so that you can concentrate on planning you day, not finding what to eat in the morning. We use the latest card technology to ensure that the property is a safe place for our guests and our great staff are always on hand to help you with your stay or your plans. Very good hostel, with good common area and great staff. It's located in the "cozy" part of Singapore with a lot of good restaurants and boutiques in the area. We where only there for three nights, but would absolutely stay longer if we had more time in Singapore! The wifi only worked about half the time, which was really annoying. Apart from that I had a good stay.